Indian retail industry, the fifth largest in the world is an ever growing sector that has been on the upward scale especially in the last few years. Comprising of largely unorganized sector, this space is fast becoming an organized sector with increased insights from the consumers and by learning carefully about the nuances of the market. This promising sector has its ups and downs and Adgully finds out what the industry leaders predict the future of this space to be and discovers consumers' perspectives on the same. This industry is expected to grow at a pace of about 25-30 per cent annually, and is considered to be a great investment market. Whether it is real estate or FMCG, the growth rates are escalating and marketers are looking at this space more seriously than ever. According to a research conducted by Annual Global Retail Development Index (GRDI), the retail business in the country has had a share of about 10 per cent in the total GDP and rose to 12 per cent in 2009. From Rs. 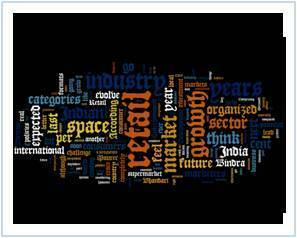 35,000 crore in 2004, the retail industry was expected to grow to 109,000 crore by the end of last year. This year has begun with a lot of new initiatives and new marketing skills to understand the consumer psyche. It is expected to go up to US$ 833 billion by the year 2013. It is further expected to reach US$ 1.3 trillion by the year 2018 at a CAGR of 10%. According to Jaspreet Bindra, Regional Director Entertainment & Devices Division, Microsoft Corporation (India) Pvt. Ltd this space is soon going to be completely organized. He said "The future of this space is going to be wholly organized. Today only about less than 10 per cent is organized and we believe that it has doubled in the last couple of years and that it will double again in the next three years." Ankur Shiv Bhandari, MD & Head, Kantar Retail India said, "I think the future of retail will not be copy and paste from anywhere else in the world but there will be a lot of inspiration and best practices that will come from outside that would help Indian retail environment evolve. It would still be a lot of indigenous stuff that would evolve to meet the needs of the Indian shopper." According to the experts, although most of the categories will show immense growth in the next few years, there are certain sectors that have exceptional potential in the coming years. "IT, Electronics and Entertainment will lead this growth, although there will be growth in pretty much all categories. Food has got major traction right now. So that is another sector which will lead the growth," Bindra added. Bhandari is of the opinion that the traditional categories like snacks, liqueur, laundry, detergent powder and the like are categories that would evolve over the next few years. Maurer further said, commenting on the challenges in this industry in the Indian market, "The huge imbalance between the local markets on the streets and the premium mall is a high challenge and to bring these two markets together is highly challenging. To merge the local khirana shop with the existing supermarket formats is indeed a challenge, considering the vastness of the market. Entry of large retail formats are yet to be seen in India. This could change with evaluations of the existing laws and policies. The consumers are in sync with marketers and are enjoying the attention they are getting. However most of them feel there could be better price variations and offers. "When I go to a supermarket, I also go for the wholesome experience; it makes me feel good as compared to a normal store. And it is convenient as I get everything I want in one go," said Anupa Negandhi, a consumer.